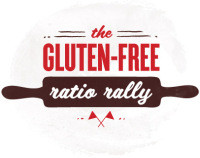 Mary Fran from Franny Cakes is hosting this month's Gluten Free Ratio Rally for brownies, so check back there for a full listing of all the brownie posts - I've also tried to include a complete list at the bottom of this post. I'll admit, I really struggled with this month's rally. My initial goal was to create a chewy but not too fudgy dairy free brownie with macadamia nuts, coconut flakes, and orange zest. I tried and tried and ended up throwing out batch after batch. Perhaps my expectations were set too high with all the delicious boxed gluten free brownie mixes out there like King Arthur. So eventually I threw in the towel and went about recreating a family favorite recipe; Chocolate Brownie Pie. 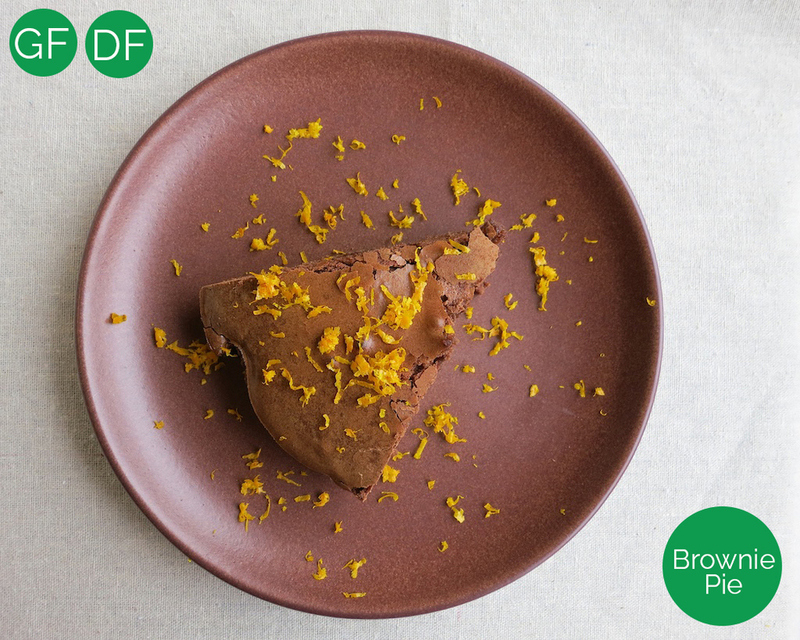 I would describe it as somewhere in between a brownie and a chocolate cake with a delicateness to it, but not at all like a cakey brownie - does that make sense? Anyway, I had much more success with chocolate brownie pie and the dairy free version actually tasted even better! The ratio I ended up with was 3 parts sugar: 2 parts chocolate, flour, and eggs: 1 part non-dairy milk and coconut oil. Line a pie dish with parchment paper. In the bowl of a stand mixer (or a large bowl), mix together the sugar and flour. In a small microwavable bowl or pyrex measuring cup, melt the coconut oil and set aside to cool. In a small non-stick pot, melt the chocolate on low. Stir constantly and remove from heat immediatly after melting and allow to cool. In a seperate bowl, whisk the eggs and then add to the stand mixer bowl and mix to combine. Add the almond milk and coconut oil and mix until incorperated. Add the melted chocolate and mix until incorperated. Add the vanilla extract and orange zest and mix until incorperated. Pour the batter into the lined pie dish and bake for about 45 minutes or until a fork inserted in the center comes out clean. Allow to cool before enjoying with a topping of your choice - I prefer a scoop of goats milk vanilla ice cream or coconut milk vanilla ice cream. Makes about 8 servings, sliced up like a pie. How do you make brownies? From the box or from scratch?